Azerbaijan`s Deputy Prime Minister Elchin Efandiyev has attended the 5th Extraordinary Islamic Summit of the Organization of the Islamic Cooperation on the issue of Al-Quds and Palestine held in Jakarta. Addressing the Summit, Mr. Efandiyev reiterated the Azerbaijani government`s support for the people of Palestine. 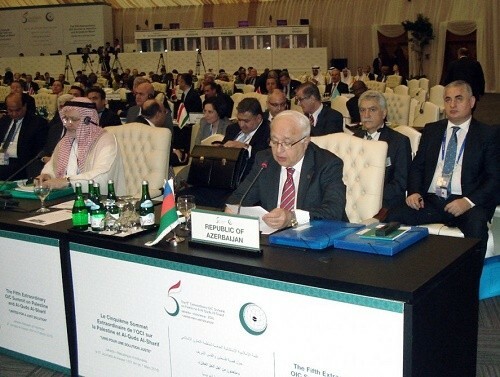 The Deputy Premier recalled the donor conference of the Ministers of Foreign Affairs of the OIC “On financing the Strategic Sector Plan for the development of the Holy City of Al Quds” and “On establishing Islamic Financial Safety Net” to assist the State of Palestine, which were held in Baku in 2013. He also expressed the Azerbaijani government`s gratitude to OIC member states and the General Secretary of the organization for supporting Azerbaijan`s just position on the Armenian-Azerbaijani Nagorno-Karabakh conflict.